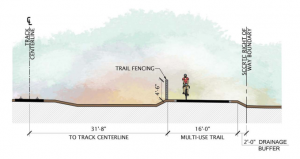 The City of Santa Cruz rail trail project will be a paved, 12 to 16-foot wide multi-use path and will serve commuters, neighbors, visitors – people of all ages and abilities. It will be built in two phases: 1) from Natural Bridges Drive to Bay/California and 2) from Bay/California to Pacific Avenue near the wharf. Construction of the Phase 1 portion is estimated to start in the Summer of 2019 and last approximately 6 months. Construction of Phase 2 is estimated to start in the Fall/Winter of 2019 and last 9-12 months. The City of Santa Cruz is the lead agency on design and construction of the Coastal Rail Trail within its jurisdiction and is working in partnership with the Santa Cruz County Regional Transportation Commission (RTC), owner of the rail right-of-way and responsible for overall implementation of the rail trail project in the county. This Coastal Rail Trail segment is the highest priority in the Santa Cruz County Regional Transportation Commission’s Monterey Bay Sanctuary Scenic Trail Master Plan. 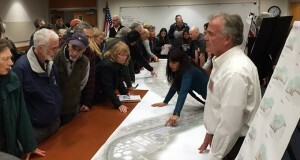 The plan identifies the 32-mile coastal rail corridor from Watsonville to Davenport for an adjacent bike/pedestrian path and another 18 miles of spur trails to provide coastal and neighborhood connectivity. The RTC purchased the Santa Cruz Branch Rail Line to provide the bike/pedestrian trail and to pursue future passenger rail service. The design and environmental services, construction, construction engineering and management, and permitting for this project is both state and federally funded, with a 20 percent local match. Community groups Friends of the Rail & Trail, Bike Santa Cruz County and Ecology Action have raised private donations as a match to public funds to help build this section of the Coastal Rail Trail. Such contributions demonstrate the strength of the community’s engagement in assisting the City on a legacy project. For questions or more information, please contact City of Santa Cruz Project Manager Nathan Nguyen at (831) 420-5188 or Cory Caletti, RTC’s Rail Trail Program Manager, at (831) 460-3201.